One of the downsides of switching to Python from Matlab is that it can be a pain to plot some kinds of things, and I’ve found animations to be one those things. 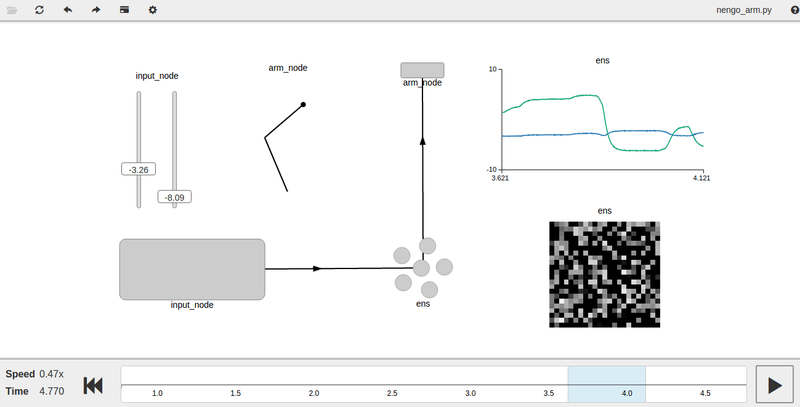 In previous posts I’ve done the visualization of my arm simulations through Pyglet, but I recently started playing around with Matplotlib’s animation function, and the results are pretty smooth. The process is also relatively painless and quick to get up and running, so I thought I would throw up some Matplotlib code for visualizing my previously described 2 link arm MapleSim simulation. """Compute x,y position of the hand"""
"""Simulate the system and update the state"""
# uncomment the following line to save the video in mp4 format. There’s not all too much to it, which is nice. I’ve created a class TwoLinkArm that wraps the actual arm simulator, stores the current state of the arm, and has a step function that gets called to move the system forward in time. Then, I created a line and stored a reference to it; this is what is going to be updated in the simulation. I then need functions that specify how the line will be initialized and updated. The init function doesn’t do anything except set the line and text data to nothing, and then the animate function calls the arm simulation’s step function and updates the line and text data. For more details about it there’s this blog post which steps through the process a bit more. For simple arm simulations the above is all I need though, so I’ll leave it there for now! Here’s an animation of the resulting sim visualization, I’ve removed a lot of the frames to keep the size down. It’s smoother when running the actual code, which can be found up on my github.